Planning a bore in advance reduces complications and saves time and money. 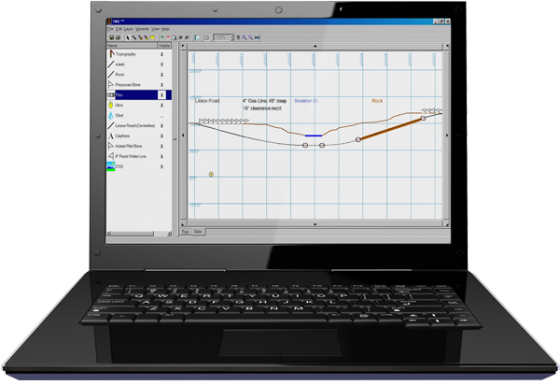 With Subsite® TMS Plus, a Windows®-based management tool, you can plan the bore, monitor its real-time progress and print out a completed survey. Intuitive menus and online user guide make the software easy to use. Enables you to create multiple bore plans for the same job based on different units or paths. Records the drill head position each time a new drill pipe is placed in the ground, and the position of the actual product during backreaming. Works with Subsite guidance equipment to create a record of the installed bore path. Compiles information such as pipe number, depth estimate, drill head roll angle, pitch, directional beacon temperature and battery level, date and time. Provides quick-reference information on bend radius for more efficient use of drill pipe and installed product. Supports five languages—English, German, French, Spanish and Italian—and adapts to different international settings. Compatible with all horizontal directional drilling (HDD) rigs. Note: TMS Plus is not compatible with Commander 7.